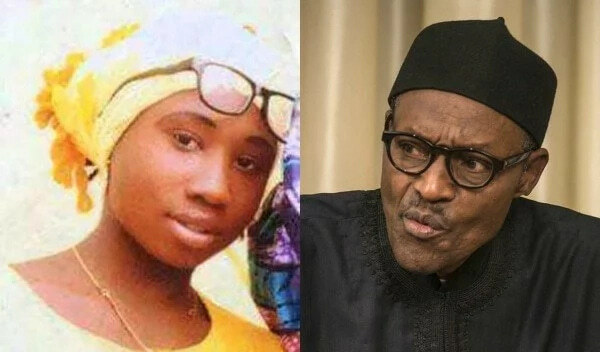 Leah Sharibu, the only Christian girl among the abducted 119 students of Government Girls Secondary School, Dapchi, Yobe state, has asked President Muhammadu Buhari to save her from captivity, which she described as a serious situation. As a “proof of life” amidst speculations on her fate, The Cable has exclusively obtained her latest picture as well as the audio of her plea to Buhari. Leah, who was kidnapped in February, also appealed that her family members be assisted. All the girls who were captured were subsequently released, except five who reportedly died in detention, but Sharibu was held back for “refusing to renounce her faith”. The Islamic State West Africa Province (ISWAP), a breakaway faction of Boko Haram, has kept her in captivity for seven months, sparking public outrage. The federal government had said it was making efforts to secure her release. Clad in hijab, sewn from a pink material and seated alone on a mat patterned in orange, Sharibu spoke with measured calmness. “I am Leah Sharibu, the girl that was abducted in GGSS Dapchi. I am calling on the government and people of goodwill to intervene to get me out of my current situation. Sources told The Cable that the audio as well as pictures were part of the proof of life requirement in a possible renewed negotiation efforts between the government and ISWAP members. The release of Sharibu’s school mates on March 21, 2018 reportedly followed what sources said had to do with the intervention of IS in Iraq and Syria. Insurgent leaders were said to have upbraided ISWAP for abducting Muslim schoolgirls. Thereafter, according to our sources, the 110 Muslim schoolgirls were released, while they held back the only Christian girl.